1997 – Inter Collegiate Competition Cash Award. 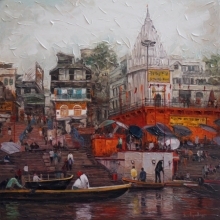 1999 – ‘Avantica’ a Group of contemporary Artist, Delhi. 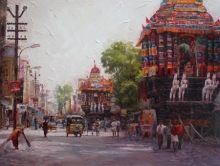 2002 – State Exhibition by Oviya Nunkalai Kuzhu, Chennai. 2016 - Gold Medal Winner in 75th All Indian Art Exhibition, Hyderabad Art society. 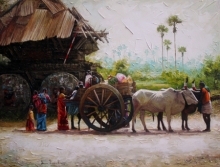 2011 – ‘Ethnic Echoes’ Beyond Coffee Art Gallery,Hyderabad. 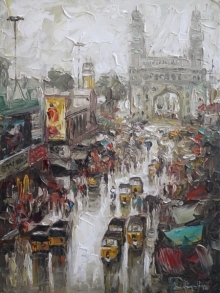 2012 – ‘Streets of India’ Beyond Coffee Art Gallery,Hyderabad. 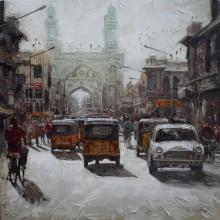 2013 – ‘Streets of India’ Vinnysa Premier Art Gallery,Chennai. 2014 – ‘Telangana Heritage’ Beyond Coffee Art Gallery,Hyderabad. 2018 – ‘Ethnic Echoes’ Jeganhir Art Gallery,Mumbai. 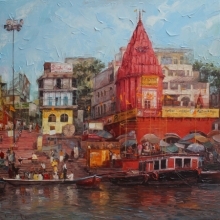 2012 – “Temple Town” In ICON Art Gallery,Hyderabad. 1 1999 – ‘SPECTRUM’ Chromatic Waves, Kumbakonam. 2001 – Group Show Vinnyasa Premier Art Gallery, Chennai. 2003 – Evoke Group Exhibition, Bangalore. 2004 – Group Show Vinnysa Premier Art Gallery, Chennai. 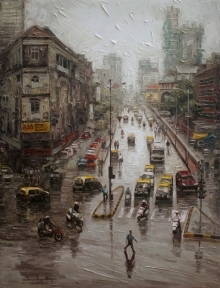 2010 – Group Show Sunny Sisytem Art Gallery, Chennai. 2010 – Group Show “ Icon Art Gallery “ Hyderabad. 2010 – Group Show “ Shrishti “ Art gallery, Hyderabad. 2013 – "Creative Artmosphere" International Art Expose at Poecile Gallery, Hyd. 2013 – 'Affortable art show 2013 &2014' Vinnysa Premier Art Gallery,Chennai. 2014 – "CREATIVE NATURE "Icon Art Gallery “Hyderabad. 2015 – "Hyderabad Art Fete @ Muse Art Gallery “Hyderabad. 2016 – Group Show “Colours of Novotel” “Hyderabad. 2016 – Group Show “She has grace like no other” Gallery Space Hyderabad. 2016 – Group Show “Colours of Deccan” Art2Day Pune. 2016 – Group Show “Kaleidoscope of colors” India Art Ideas, Delhi. 2017_ "Impossibilities” Creative Art Gallery, Delhi. 2017_ "World Art Dubai 2017” Cross Borders Art Gallery, Dubai. 2017_ "Kaleidoscope of Colors”” Indian Art Ideas, Delhi. 2017_ "Beyond The Contours” Mon Art Gallerie, Kolkata. 1998 – 99 : An Indian Craft Fair, Chennai conducted by South Zone Cultural Centre. 1999 – South Cultural Centre, Madurai. 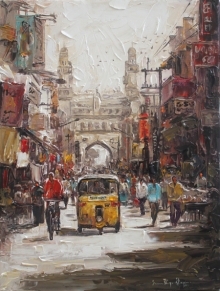 2019 – “Urban Views” Jaipur organized by Gallery one Art Gurgaon. 1996 – 99 : Oviya Nunkalai Kuzhu, State Exhibition, Chennai. 1997 – 2003 : Victoria Technical Institute, Chennai. 1998 – 99 : ‘Avantica’ A Group of Contemporary Artist, New Delhi. 1998 : All India Art Exhibition, Hyderabad. 1998 : 28th Annual Exhibition, Lalitkala Parishad, Visakhapattinam. 1999 : South Indian Artist Art Exhibition, Calcutta. 2000 : State Art Exhibition by Tamilnadu, Oviya Nunkalai Kuzhu, Chennai. 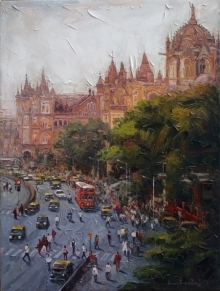 2011 _INDIA ART FAIR, Mumbai. 2014 _'Art Expo Malaysia 2014' The Gallery of Gnani Arts,Singapore. 2014_ "Spandan's art festival in Goa. 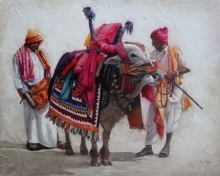 2014_ "Alla prima Art fair in Delhi. 2016 75th All Indian Art Exhibition, Hyderabad Art society. Many Private Collections in India & Abroad.